"An interesting tool for working with gender differences." Men at work do it all the time: They brag, cover up their mistakes, pretend to know what they don't, start fights. And they still get ahead Why? As psychologist Adrienne Mendell learned when she interviewed one-hundred male executives, the traits that women spend their entire lives erasing from their personalities are actually the qualities that men value in the world of work. And since men are still in the power positions, if you don't play it their way, you don't play at all. * You're mad because you want your male boss to let you control your projects. But you've got to take control--that's the only way you'll get it. * You're steamed because a male colleague consistently takes credit for your work. Do you make a point of touting your accomplishments? * When you make a mistake you apologize. But the man you apologize to doesn't think you're polite--he thinks you're admitting incompetence. * A fight with a male colleague leaves you shaken. But the men in your office shout at each other for an hour and then go out for a beer. These are the times that try women's souls The strategies, insights, and eye-opening advice in How Men Think will help you get along better with the boys and propel you to the top where you belong. "The more women have opportunities to play sports the more proficient they will become in competing in this men's world of 'unwritten rules.' 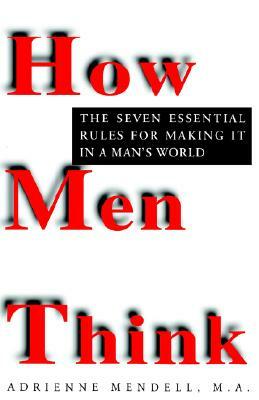 To bridge the gap, Mendell's book, How Men Think, is a necessary guide for women working with men."